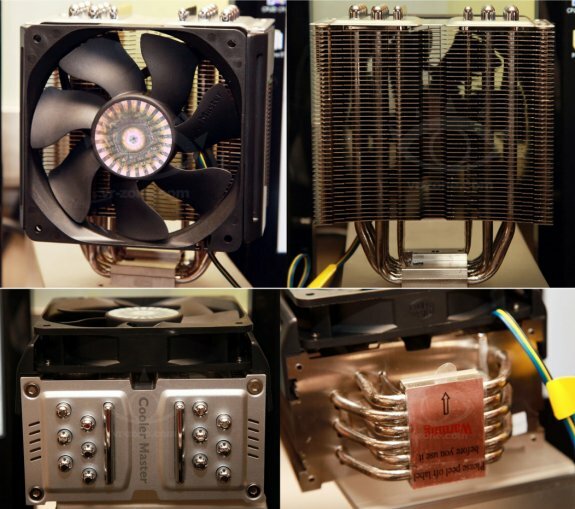 VR Zone reports Cooler Master has a vapour chamber CPU cooler on display at CES 2012. The TPC 812 has a copper base, six U-shaped copper heatpipes, a vapour chamber block in the middle, an aluminium fin array and a 120PWM fan. The HSF uses the same fan bracket as the V6 and newer Hyper coolers, and supports Intel's new LGA2011 socket. According to Cooler Master, the TPC 812 can handle over 240W of heat and performs close to or better than entry-evel single-radiator watercooling kits. Pricing is said to be around the $100 mark though, which seems quite excessive.